December 24, 2013, 9:46 a.m.
Ed Balls caused a stir last week by showing up to a commons vote on banking reform dressed as Father Christmas. Balls arrived directly from playing the role of Father Christmas at the Westminster Kids Club Christmas party, and proudly posed for a picture with Labour MP Pamela Nash. The idea of Father Christmas taking the Labour whip however, doesn&apos;t come as too much of a suprise to the British public. YouGov research shows that the British public think that given the opportunity, Father Christmas would vote either Labour or Green. Excluding those who either don’t know (19%) or think he wouldn’t vote at all (25%), 27% of Brits think Father Christmas is a Labour voter, although the Green Party comes a close second with 23%. Despite his penchant for hand-outs, 17% think Father Christmas is a Conservative and 13% think he would vote UKIP. Just 6% think Father Christmas would vote Lib Dem. Support tends to fall along party lines, which makes the strong Green Party support all the more interesting. A majority of Labour voters (64%), Conservative voters (59%) and UKIP voters (60%) all believe that Father Christmas would vote for the party that they support. 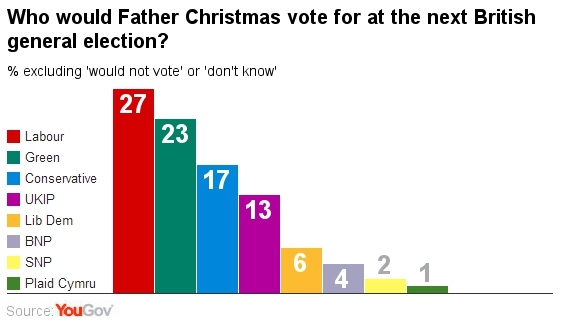 Worryingly for the Liberal Democrats however, just 30% of their voters think Father Christmas would vote Lib Dem. A German museum has applied for Father Christmas to be added to the UNESCO list of cultural heritage. Felicitas Hoptner, director of the German Christmas Museum is keen to protect the original German "Father Christmas" character from the influence of the more recent American incarnation of "Santa Claus".